Gnålodden is located centrally in Hornsund under the mountain Gnålberget. You have to keep an eye on many underwater rocks as you are approaching by boat, they have killed many zodiac outboard engine propellers. Gnålodden is a place with a lot to see within a small area. Just the rocky shoreline is a sight in itself. The flat area is of limited size, but beautifully green with its mossy tundra, a clear indication for the presence of large numbers of Brunich’s guillemots and kittywakes that breed in the steep cliffs of Gnålberget. The old hut, which was built in 1907 or 1908, is a real eyecatcher. Until the protection of polar bears in 1973, it was part of a classical polar bear hunting area. The bears came with drift ice around the south cape, up the west coast and into Hornsund. In some years, hundreds of them migrated through the fjord and back to the east coast: rich hunting grounds for trappers, including the legendary Norwegian female hunter Wanny Woldstad, who was one of the first active lady hunters in Spitsbergen when she wintered several times in Hornsund during the 1930s. 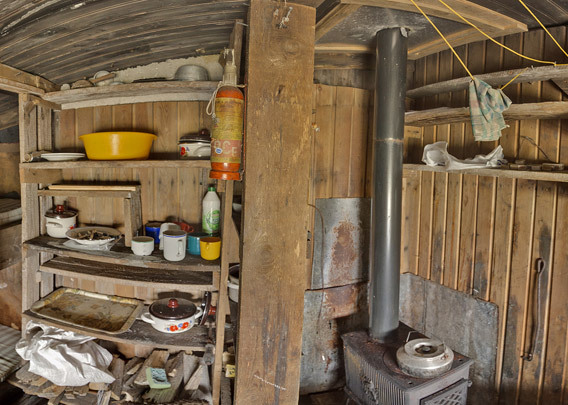 The panorama shows the main room of the hut, which is still regularly used by scientists from the near-by Polish research station and accoasionally by locals from Longyearbyen who take the long trip with snow mobiles.